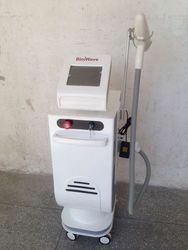 Providing you the best range of nd yag laser tattoo removal machine and hair & tattoo removal laser machine with cooling rf with effective & timely delivery. If you’re looking to buy the best value quality laser tattoo removal machine in the industry right now, then we are confident that the Nu Tatouage is the right option for you. Although tattoos were once considered to be permanent, it is now possible to remove them with our laser machine. Our tattoo removal machines are non-invasive. They utilise Nd-YAG laser beam operating at 1064nm, and cutting-edge Quality Switched (also known as Q-switched) Nd-YAG laser beam operating at 532nm. Older tattoo removal techniques included dermabrasion, seal abrasion, excision, cryosurgery, thermal destruction and continuous wave lasers. We use state of the art technology and provide a second to none customer care service; something we remain proud of for all the laser products we have on sale. Tattoos are created by the introduction of a pigment into the dermal skin layer. They can broadly be divided into professional, amateur, and cosmetic tattoos. Professional tattoos are applied with a tattoo machine into the deeper layer of the dermis and are applied to be permanent in nature. They generally require repeated treatments to remove. Amateur tattoos are usually smaller, lighter in colour and applied more superficially using handheld needles or homemade machines, which render them easier to remove. Cosmetic tattoos are often referred to as permanent makeup and are increasingly becoming popular. Permanent eyeliners, eyebrows, and lip liners are commonly applied using the process of micro pigmentation. However, the inks used often contain pigments that are red, brown, white, or flesh coloured; inks containing titanium dioxide and iron oxide are difficult to remove. 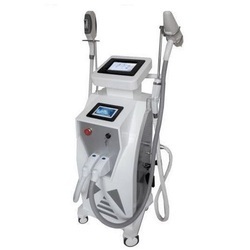 The laser light must penetrate sufficiently deep into the skin to reach the tattoo pigment. The laser light must be more highly absorbed by the tattoo pigment than the surrounding skin. The time duration (pulse duration) of the laser energy must be very short so that the tattoo pigment is heated to decomposition temperature before its heat can dissipate to the surrounding skin. Sufficient energy must be delivered during each laser pulse to heat the pigment to decompose. At each treatment, some but not all of the pigment particles are effectively decomposed, and the smallest particles are removed by the body over the course of several weeks, which results in lightening of the tattoo. Any remaining larger ink particles are then targeted at subsequent treatment sessions, causing further lightening OPT (Optimal Pulse Technology).